Following on from last week’s NYT article about the archery ‘explosion’ in the US – which appears to be replicated in many other countries – someone alerted me to what Louis Vuitton has been up to. For the last seven years LV has been the world’s most valuable luxury brand, and it appears that someone there has been noticing which way the wind is blowing. But that’s not all. 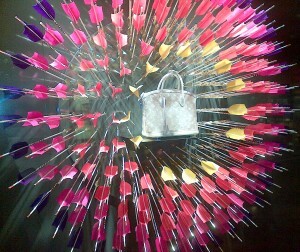 At LV’s Boston store, amongst others, someone has been building arrow based window displays in order to sell, um, handbags. pictures from The Savvy Bostonian. Does it stop there? Hell no. 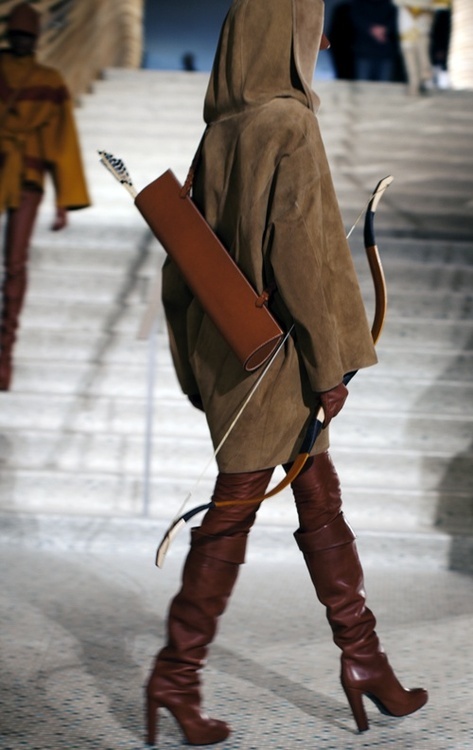 Hermès has been sticking archery on the runway recently – as, naturally, the perfect accessories to accompany a decidedly Robin Hood-ish winter collection. As to what to make of all this, meh. Archery has been sexed-up this year – rather against its will – by a now familiar combination of films, TV and the Olympics coverage. 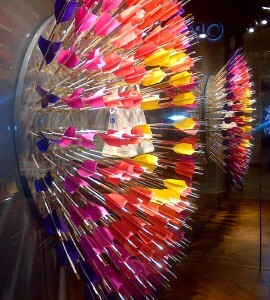 The fashion world of course has no interest whatsoever in archery as a sport. If, say, fencing had been similarly treated, you’d be seeing sabre brooches and models badly wielding foils on the runway (actually fashion runways are a bit like fencing pistes… this could work…). On one hand, the aesthetics of archery is a big thing for me. 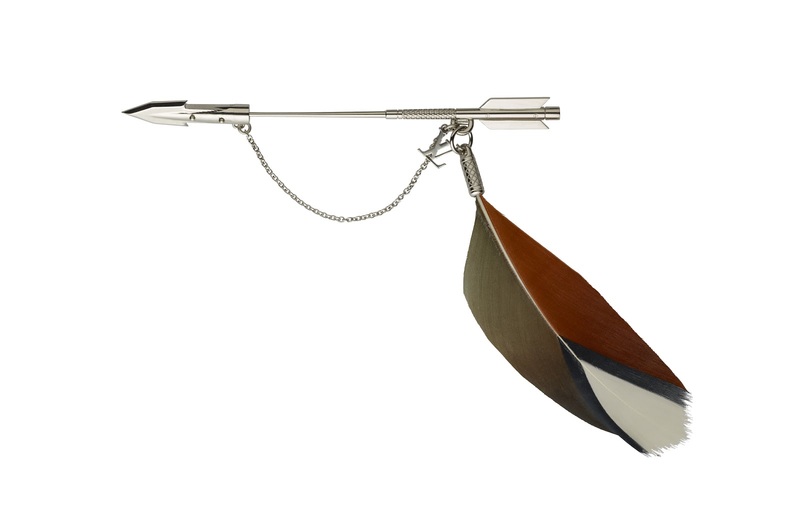 I think bows (particularly recurves) are beautiful things both in use and in their own right; and that’s one of the things I wanted to bring to this archery blog. I can understand why someone would want a piece of that. And if it brings more people into archery, or indeed any sport, all the better. Everyone has to find some route in. It’s not like people don’t quickly find out that ‘being Katniss’ is difficult. On the other hand, it trivialises and reduces an ancient tradition and a modern sport into something – anything – to flog handbags and monograms with. Ooh I love the brooches. 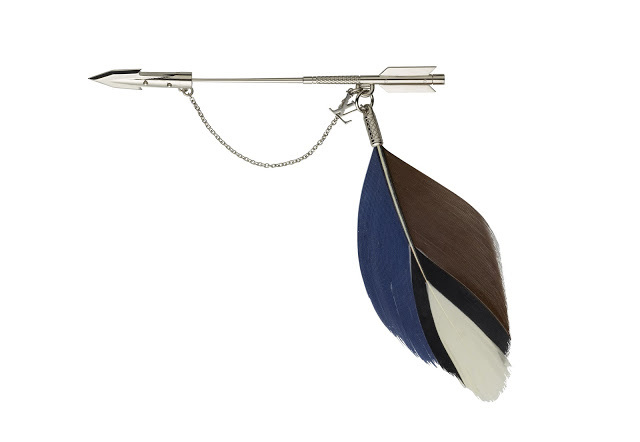 Oooh I like the brooch. Maybe they could make you a more manly version?